Few months ago I read about the launch of a new CC cream by the brand blackUp. I was all excited because unfortunately there are not many choices for dark skinned women on the market. 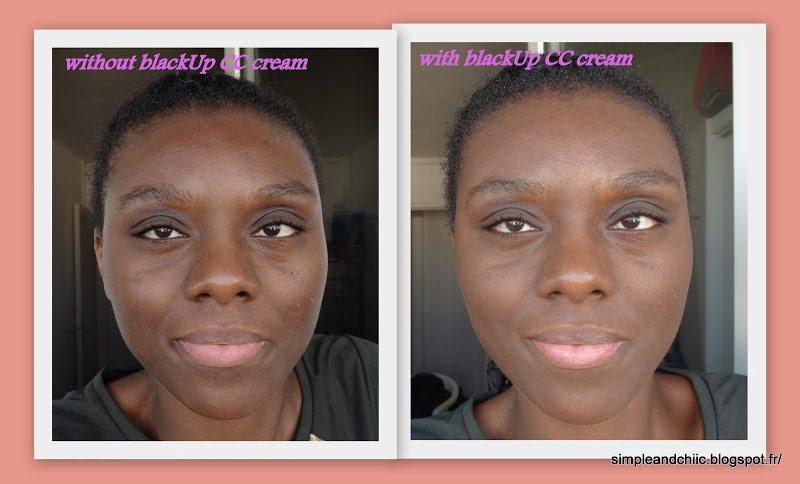 It is called the “CC Cream Multi-Action” and it is the first CC /BB Cream by blackUp; a high-end French brand specialized in make up for dark skinned women. I have tested other BB/CC cream or tinted moisturizer in stores before but so far none of them have matched my skin complexion enough; so this one is my first purchase. The CC cream is available in 5 different colors to fit “Black” women from fair to dark skin, but I think that one darker shade would have been perfect. I compared the 5 “brown” colors and they are all neutral at the exception of the color n°5 which has red undertones. It was a surprise for me because I know that their foundations have a good mix of undertones colors (neutral,orange,yellow,red). I had to buy 2 CC creams to get my shade. Why? Because my skin complexion is difficult to match as I have a mix of yellow, orange and red undertones. The darkest shade (n°5) is a little too dark and too red for me and the n°4 in the opposite is a little too fair and too neutral so I decided to mix both colors. It is not a perfect match but it is a good one. The CC cream has the consistency of a moisturizer. You need to work it fast into your skin as it will dry quickly. I applied it the way I would apply my foundation, meaning that I use my fingers and I do not use a lot of product. The product is paraben free/oil free/fragrance free. I have used it several times so far and it has not broken me out. The brand states that it does not contain sunscreen because it tends to make black skin looks ashy; but I know that the Iman BB cream does contain a SPF15. Does it bother me? No, because most BB/CC creams have a SPF of 15 and I consider that a SPF is worth starting SPF30 (find out more here). For that reason in the summertime I would mainly use that cream in the evening. BB/CC creams are designed to act as a makeup and as a skincare, so it is supposed to have short term and long term benefits. So what does this CC cream claims to do? 1/Moisturizing 2/Matifying: yes it does what it states. 3/Radiance boosting 4/Lightweight: those points are the most important ones for me as they are the ones that make a foundation look natural. I have to say that I am disappointed about those points because on my skin the cream feels heavy even if I only apply a small amount. It does not feel physically heavy but what I mean is that when I check closely with a mirror I can see the cream sitting on my skin and I don’t like that. 5/Pore minimizing: it does work when you have just put it on, but not much longer than a few hours on my skin. 6/Excess sebum reducing 7/Rebalancing 8/Skin tone unifying: for short term benefits I totally agree with those points I think they are the strengths of this CC cream. For the long term effects of the above points; I have not used the cream long enough to notice anything. To be honest, personally I do not believe in BB/CC creams long term benefits as it is already very difficult to find a specific cream or serum that works. But that’s just my opinion. I wore the above makeup on a hot sunny day (91°F) from 9 am to 6 pm. I did not use any powder or primer to get a true opinion on the CC cream quality.You can see on the pictures that there is not a big difference between the before and after. It is because it has a really good staying power. The pictures can’t show everything but my nose got shiny and my pores were more visible at the end of the day. This is my review on how the product works on my skin. But remember that I have combination skin; and I have tested the product in summer times on hot and sunny days. To be honest to give a 100% honest final opinion I need to try it in the winter times as well. I will do an update review in a few months. What about you? Do you have any BB/CC cream and are you satisfied ? I absolutely love how it looks 0n you. Gorgeous!!! Thank you :-) You're from South Africa that's great ! I visited Cape Town a few years ago; I love it and you have GREAT food... For the BB cream; actually I sould have known better than the shades would not work perfectly because there is no yellow undertone and I need it. But yes very often I need to mix 2 colors to get my shade and usually the problem is not that it is too light or dark but we have to be very carefull with the undertone.! Thank you for your review - I found it most helpful!!! You're welcome, I am glad it helps !